At this time, the Messenger Marshall Vian Summers is engaged in the historic project of compiling the books and volumes of the New Message from God in their entirety. At the same time, the mysterious process of Revelation continues. God continues, through the Angelic Assembly, to deliver new Revelations through the Messenger at this time, which will ultimately find their way into the books and volumes of the New Message. 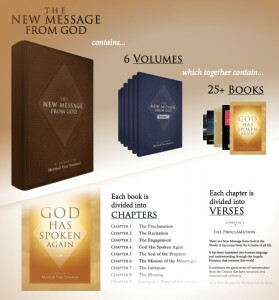 Therefore, as the Messenger proceeds in this historic work of compilation, and as God and the Angelic Assembly continue to reveal more through their Messenger, the books and volumes available here at www.newmessage.org will continue to grow, opening new dimensions, leading us and preparing us for the times ahead. We are now living at a time of Revelation. We are blessed to witness the process of Revelation unfolding before our eyes. We are privileged to witness God’s Messenger compiling a new testament for humanity, in his own time and according to the direction given to him by the Creator. This stands in contrast to the fact that the books of Revelation of the past were not compiled and presented by their Messengers in their own lifetime, thus leading over time to problems in interpretation and corruption of the original texts. At over 9000 pages of text (with nearly 1000 audio revelations at their source) the New Message from God is the largest and most comprehensive Revelation ever given to humanity, given now to a literate world of global communication and growing global awareness. The scope and depth of this corpus of sacred text exceed that of any previous Revelation and has been given to meet the complex set of global needs and challenges facing our modern world, both now and into the future. 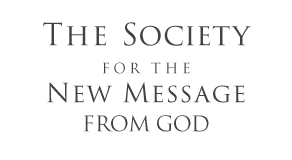 Every day The Society for the New Message from God, amongst its many other important tasks and limited resources, is working to render this great Revelation, making it available to the world in as many languages as possible (20 languages at present), in multiple formats (online, print, ebook, video), working to make it available to people on every continent, in every country. And yet behind the scenes, an even greater project is underway. 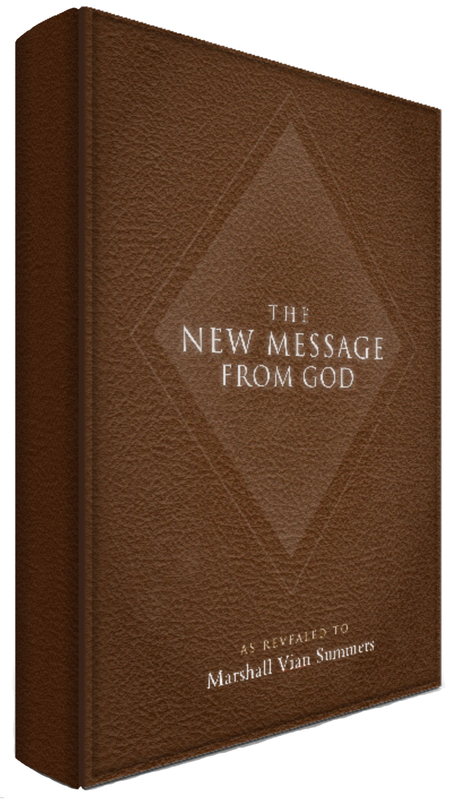 Now and in the years ahead, the Messenger comes closer to accomplishing his great task of compiling the New Message from God into the One Book and presenting this new testament to the world. The Angelic Assembly has directed the Messenger to unify the New Message into a single testament for humanity. This testament will be divided into volumes: each volume divided into books; each book is divided into chapters and the text of each chapter is presented in verse. Therefore the future structure of the New Message could be expressed in this way: Volume > Book > Chapter > Verse. In totality, these volumes, books and chapters will ultimately be unified into a single testament: The New Message from God. In the New Message, there are two types of books: those given as books by the Source and those compiled into books by the Messenger from hundreds of freestanding revelations. The freestanding revelations were given over a 36-year period and, in recent years, in locations around the world. These freestanding revelations are now being compiled into books by the Messenger, who alone has been charged with this task of organizing and presenting the New Message from God. Therefore, it is the Messenger’s task to gather together the individual revelations and unite them with the existing books of the New Message to be a complete testament for humanity. At the same time, he must present this testament to humanity and bring it to individuals around the world who are ready to receive it. This is a monumental task. The compilation of the entire New Message is a work-in-progress being undertaken over an extended period. At the same time, the Revelation continues to be received with new teachings being given every year. As a result, the selection of chapters in each book may change. With this, the title of the books may change as well to reflect the growing scope of each book. 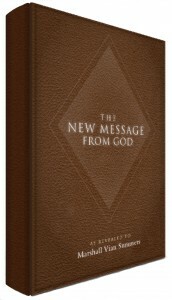 The books of the New Message will ultimately be contained in six volumes. Each volume will grow in size over time as new revelations are given by the Source and as the Messenger compiles new books and places them in their respective volume. Ultimately the six volumes will be joined together in a single testament for humanity. This new testament will contain every word of God’s New Message for the world. For the first time in history, the Messenger himself is compiling and presenting the pure text of God’s Revelation. Here the Messenger seals in purity the texts of God’s New Message and gives them to you, to the world and to all people in the future. Whether these texts are read today or 500 years from now, God’s original communication will speak from these pages with the same intimacy, purity and power as on the day it was spoken. Furthermore, a large number of the audio recordings of these spoken Revelations will be made available alongside the text. This then offers the individual a place of intimate and personal proximity to original delivery of God’s communication to the world, on the day, in the place, in the moment it was spoken. Remarkably, for the first time in history, the Voice of Revelation has been preserved and will be available into the future for all people to experience. This gift is being given to the world now. It is born of the love of the Creator, a great love that has the power to reawaken Knowledge at the heart of the human family and to prepare and protect humanity as it faces its greatest trials in the future. With greater financial support, The Society will be able to make more of these wisdom teachings available free online. In addition, The Free Book Project of The Society offers a free personal copy of currently available books and mp3s of the revelations of the New Message to those without the means to purchase them. We invite you to make a donation to support the Free Book Project so that more and more people in need can have access to the New Message from God.